Chris Packham said recently that Mark Avery’s petition to ban driven grouse shooting in England “is designed to be provocative”. As of last night, having now achieved ten thousand signatures, he is guaranteed a written response from Defra. That is quite an achievement. The GWCT did not support this e-petition for reasons given here – but thanks to the help of all the people who did want to be “provocative”, Defra must now put pen to paper. Thank you for that. 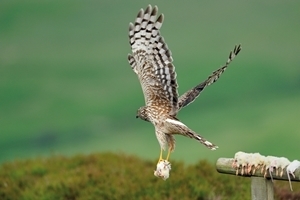 Birders Against Wildlife Crime (BAWC), who are the original organisers of Hen Harrier Day, have managed to galvanise a real focus on hen harriers this year. BAWC kindly interviewed the GWCT here. Congratulations to all at BAWC for helping raise the profile of hen harriers. The burning question is how will Defra choose to respond on hen harriers? We have talked before about the Defra-led Hen Harrier Joint Recovery Plan and when this may be published. The delay would appear to stem from one of the partners that drafted the original recovery plan. It is hoped this single concern, now raised by the RSPB, can be swiftly resolved because it relates to a conservation technique successfully used in France and Spain for years – so the evidence is there. Why not show Defra your support by signing this e-petition simply asking Defra to publish the Joint Recovery Plan? This is a comparatively simple thing to ask, and the more people who sign the greater the likelihood that Defra will do so. Signing only takes a couple of minutes, and it would be wonderful if you, and any of your friends or family who may want to, would add your name to an already impressive number of people who have signed. If you want to know more about the current controversy regarding hen harriers, a great deal of relevant information is available here.